Hot weather and high blood sugar can both cause dehydration. That’s why it is especially important for those with diabetes to stay hydrated throughout the day. Keep water with you at all times and limit other beverages such as coffee, soda and sports drinks. Stay in the shade in the shade as much as possible. If you can, schedule your activities during the cooler hours of the day such as early morning or late afternoon. Wear a hat and sunscreen when you do need to step out into the heat. 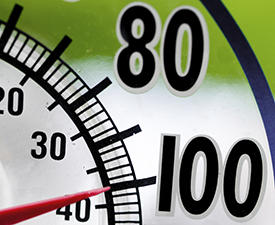 You may want to check your blood sugar more frequently during hotter weather. Also, be sure to not store insulin, oral medicine, or medical equipment in direct sunlight or in a hot space. Pack extras of all your supplies if you are travelling. You need to keep tabs on your condition at all times, especially if you are exercising or working outdoors. Dizziness, headaches, nausea, rapid heartbeat and excessive sweating are all signs that you need to remove yourself from the heat. Move to where there is air conditioning and drink plenty of water. Seek medical attention if your symptoms do not subside. Heat safety and diabetes can coexist as long as you are proactive and attention to detail is maintained. If you currently have type 2 diabetes, would like to be more active in your treatment and are interested in partaking in a clinical study, give us a call at 212-480-3333 to see if you qualify.